So I thought it would be great to post a summer makeup look, a refreshing and vivid one. Let's have some fun cause I don't wanna give up summer! If you have any questions about products I used for this makeup look, please let me know, I'll answer as soon as possible. I miss you guys, thanks for your support and for sending me emails and comments, I read them all. Incredible! I love your detail and use of color!! Beautiful. Mmmm this is such a cool look! Love all these colors? Is it waterproof or no? 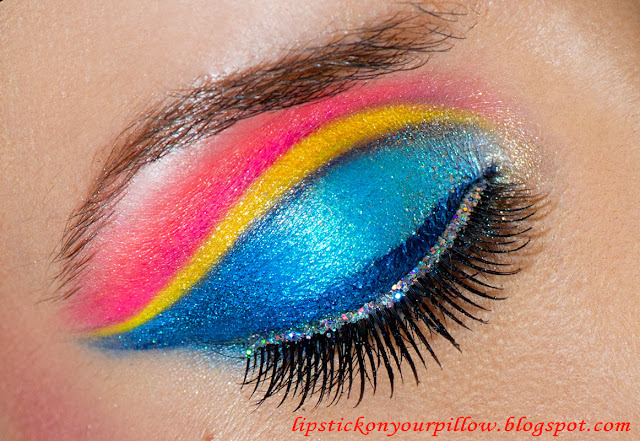 Adore this look- so amazing colors!!! wow this is amazing! i am just in awe of your talent... such a professional! Hello there! My name is Emily and I run a Lifestyle blog that has only been going for 7 months, but has grown quickly! I love your makeup tutorials, and was wondering if you'd like to do a guest post makeup tutorial for my blog here in the next couple weeks? I was hoping for something halloween inspired or themed, such as a spacific character type of tutorial. Let me know if you're interested! I'd love to have you, and generate lots of traffic for your blog! I can't believe how creative and beautiful this is! Just stunning!